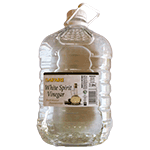 Safari White Spirit Vinegar is a naturally fermented vinegar, great for salad dressings and on fish or chips. Can also be used for pickling. Spirit Vinegar is produced from the finest alcohol distilled from sugar cane. It has an off-neutral taste and is widely used as a natural acidifying ingredient by food and condiment producers. It is also an economical flavour enhancer when used in home cooking. Professional catering size vinegar. Ideal for lodges, hotels, restaurants and catering businesses.